Veghel, Netherlands – Minkels, a global supplier of energy-efficient data center solutions and part of the publicly traded company Legrand (NYSE Euronext Paris: LR), has launched a new solution within its VariconPower® power distribution product range. The modular Busbar Systems with Smart Tap-Off Boxes offer seamless integration with Cold Corridors®, providing flexible configuration options for customer-specific Cold Corridor layouts in data centers. The integrated Busbar System covers data center power distribution options varying from 160 amps to 1000 amps. The system is suitable for both large and medium sized data center environments. The solution, originally developed by Minkels’ parent organization Legrand – a global specialist in power distribution, is a safe and structured alternative to power distribution using traditional cabling. Minkels has developed an innovative Smart Meter for the Busbar System for accurate monitoring of the energy consumption. The Smart Meter is compatible with VariconPower rack PDUs, Varicontrol-C cable distribution panel measurement and supported by the Energy Monitoring software appliance. The intelligent measurement system can be extended by users with additional functionality such as temperature readout and circuit breaker status readout, including alerts. The Smart Meter can be integrated into a Tap-Off Box, or placed externally. Minkels will be demonstrating its integrated Busbar System with the Smart Tap-Off Boxes for the first time at the Data center World Conference and Expo in London, which is being held on 26 and 27 February 2014. The new Busbar System plus Smart Tap-Off Boxes is being offered by the data center manufacturer as a new modular layer on top of the Next Generation Cold Corridor® that was launched last year. Key features of this Cold Corridor solution are not only that it is energy-efficient, but above all that it is modular – indeed, it has taken that concept to the extreme. Minkels launched the first version of its Cold Corridor solution at CeBIT in 2006, at a time when energy efficiency and aisle containment in data centers was a relatively unknown phenomenon. 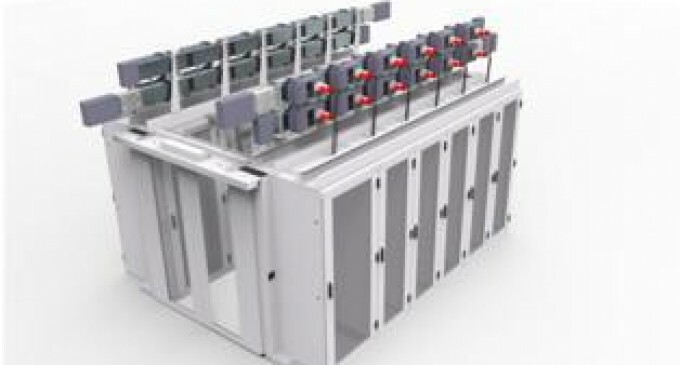 The modularity of Minkels’ new Next Generation Cold Corridor®, which goes right down to the details of the construction, means that the aisle containment solution – like the busbar systems – can evolve flexibly and scalably along with user requirements in data center environments. The design of the Next Generation Cold Corridor has embedded a wide range of client best practices, which optional modules allow customers to implement in their own specific datacenter environment. There are for instance optional modules available for fire safety (making the Cold Corridor compatible with various types of fire extinguishing systems), for access security, airtightness and data center monitoring. The integrated power distribution through Busbar System and Smart Tap-Off Box has now been included in a new modular option for the Next Generation Cold Corridor. In order to obtain a clear picture of data center power distribution needs in practice, Minkels organised a ‘busbar forum discussion’ in which data center managers and designers discussed the market’s current wish lists and requirements. Minkels’ product designers used this information when coming up with the final design. Minkels Busbar Systems with Smart Tap-Off Boxes can be delivered worldwide immediately, as standalone solutions or as optional modules with the Minkels Next Generation Cold Corridor. The Smart Meters are expected to be brought to the market in Q2 2014. Minkels has a number of international subsidiaries, including ones in the Netherlands, France, the UK, Belgium and Switzerland. In addition, the data center manufacturer provides services for its customers worldwide through a carefully selected network of partners and through the worldwide distribution and service network of its parent company Legrand. Minkels (www.minkels.com) is a knowledge-driven producer and worldwide supplier of high-quality complete solutions for data center infrastructure. The Minkels brand is part of the product portfolio of Legrand, a publicly traded company (NYSE Euronext Paris: LR) with worldwide sales in the low voltage installation, data network and data center markets. Legrand operates in more than 180 countries and achieved worldwide revenues of 4.4 billion euros in 2013. Modularity and energy efficiency are key principles within the extensive Minkels product range. The very nature of the modularly structured data center products creates a highly scalable customer solution that responds to dynamic requirements within the data center environment. Because of their energy efficiency know-how, Minkels have been asked to provide input to European guidelines for energy efficient datacenter layouts, the so-called Code of Conduct for Data centers. The Minkels product range includes modular solutions for data center racks (Varicon®); data center cooling, including DX cooling for small server rooms and Cold Corridor® aisle containment solutions (VariCondition®); data center power distribution (VariconPower™); data center monitoring (VariControl®); as well as a wide range of data center accessories.